Quackery is a type of health fraud that promotes products and services that have questionable and unproven scientific bases. Quackery is short for quack-salver, which is derived from two Middle Dutch terms that mean "healing with unguents." However, quacken means "to boast," so a kwakzalver might be a healer who boasts about his power or products. Garlic is frequently touted as a remedy for high blood pressure, blood sugar imbalances, and arterial plaque. Some advocates even claim that garlic can prevent or cure cancer. 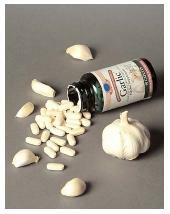 But according to the National Center for Complimentary and Alternative Medicine, although garlic may have some health benefits, its reputation as a miracle remedy is not supported by available research. Quacks, the people who promote these products, have been around for years. One of the most enduring images of nineteenth-century medicine is the charlatan or quack. These individuals sold primarily patent medicines that promised to cure everything from cancer to the common cold. Patent medicines were concoctions (elixirs, salves, balms, etc.) for which individuals received exclusive rights to sell for a given period of time. Patent medicines were available by mail or over the counter at chemists' shops, general stores, and even seed stores. Most patent medicines contained alcohol, and many also contained opium or morphine. Virtually none contained the "healing" ingredients they claimed to have, and none healed. Some quacks were called "snake oil" salesmen. These individuals traveled from town to town, sometimes with a carnival, selling their products. Today, quacks have more sophisticated ways to sell their products. The products are now promoted on the Internet, TV, and radio; in magazines, newspapers, and infomercials; by mail; and even by word-of-mouth. Many consider quackery to be a pejorative term and now use the term alternative medicine. However, this term is used in a variety of ways. The physician Stephen Barrett suggests that "alternative" methods be classified as genuine, experimental, or questionable, whereas quackery refers solely to questionable and unproven methods. Promise quick, painless cures or results. Claim to be effective for a wide range of ailments. Promise weight loss without dieting or exercise. Claim to be made from a special, secret ingredient. Use testimonials or undocumented case histories from satisfied patients. Offer an additional amount of the product as a "special promotion." Nutrition quackery is one of the most profitable types of quackery. Dietary supplements, weight loss products, herbal remedies, and "sports" foods are not registered with the Food and Drug Administration (FDA). Federal law allows certain claims to be made on the labels of food and dietary supplements. These include claims that show a strong scientific link between a food substance and a disease or health condition. These approved claims can state only that the product may reduce the risk of certain health problems, not cure them. The labels of dietary supplements must state that the claim "has not been evaluated by the FDA," and that the "product is not intended to diagnose, treat, cure, or prevent any disease." Yet, the infomercials and ads for many products do not include these warnings. One of the basic premises of many dietary supplements is that most individuals have vitamin and mineral deficiencies. In addition, the promoters of supplements often assert that the soil in which food is grown is often nutritionally depleted in vitamins and minerals , and that the food supply cannot, therefore, adequately nourish the population. However, very few individuals in industrially developed countries suffer from specific vitamin and mineral deficiencies. They are more likely to suffer from heart disease , hypertension , obesity , and other chronic diseases. In lesser-developed countries, deficiencies are due to inadequate food intake. Nutritional deficiencies can be corrected with a well-balanced diet . In addition, most manufactured products are fortified with specific vitamins and minerals. The body recognizes and utilizes these nutrients as effectively as the ones sold in health food stores, though processed foods can be lacking in other nutrients, such as fiber . Another claim is that food additives and pesticide residues are poisoning the food supply. This claim is usually used to promote organic and other "health" foods. The United States government has very strict standards for the use of additives, preservatives, and pesticide residues. The United States Department of Agriculture has approved standards for organic foods, but it makes no claim that organic foods are safer or more nutritious than conventionally grown foods. The term "patent medicine" originated before the American Revolution, when members of European royal families granted "letters patent" allowing the use of their endorsements to advertise products. As patent medicines became increasingly popular during the nineteenth century, traveling "medicine shows," featuring musclemen and other entertainers, were organized to pitch products that were alleged to miraculously cure cancer, venereal disease, tuberculosis, cholera, leprosy, arthritis, or other ailments. The pitchmen touted their products' exotic origins (such as "Kickapoo Indian Sagwa," supposedly based on a Native American recipe) or their basis in scientific breakthroughs (such as "Bonnore's Electro Magnetic Bathing Fluid" and products containing radium and uranium). The medicines, which frequently combined narcotics such as cocaine in an alcohol base, were both toxic and addictive. During the early twentieth century, newspapers began to publicize the hazards of patent medicines. In 1906 Congress took the first steps toward outlawing the most fradulent and dangerous claims by passing the Pure Food and Drug Act, and in 1938 patent medicines were prohibited entirely. Anti-aging products. In a youth-oriented society, a wide variety of products are advertised. No product can stop the aging process, however, and any "results" that are seen are temporary. Arthritis remedies. There is no cure for most forms of arthritis, but some products can temporarily reduce pain and increase flexibility. 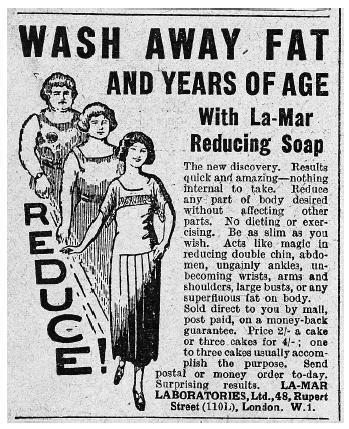 A 1920s advertisement for weight-loss soap promises quick, painless results and offers a money-back guarantee. Both claims are frequently made by quacks about the fraudulent health products or services they sell. • Cancer cures. Quacks prey on people's fear of cancer. Cancer treatment is specific for the type of cancer, and common treatments include surgery, radiation, and chemotherapy. Some cancers go into remission and reappear later. No food or supplements have been proven to "cure" cancer. HIV/AIDS cures. There is no known cure for this disease. Legitimate scientific treatments can, however, extend life and improve the quality of life for people with AIDS. Quackery is big business. Individuals spend billions of dollars every year looking for the next miracle cure. Consumers must learn to protect themselves by questioning what they see or hear in ads. The media that promote these products usually do not regularly screen their ads for truth or accuracy. Prescription drugs undergo rigorous testing for safety and effectiveness before they are sold, and over-the-counter medicines also are subject to a drug review process. Dietary supplements are not required to undergo government testing or review before they are marketed, yet these products may have harmful effects that could present risks for people on certain medicines or with certain medical conditions. Individuals who are aware of a questionable health product can contact the Federal Trade Commission or their state attorney general's office. SEE ALSO Alternative Medicines and Therapies ; Cancer ; Dietary Supplements ; Fad Diets ; HIV/AIDS ; Weight Loss Diets .